Info "Pay attention! Don't let the ball hit the ground!" Serve Already! is one of Kat and Ana's microgames in WarioWare: Smooth Moves. When playing the game, the player has to use "The Remote Control" form in the first and second level and "The Sketch Artist" form in the third level. 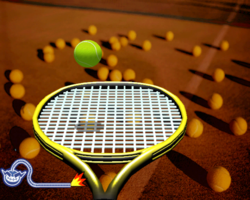 During this microgame, the player must bounce a ball off a racket until the time runs out. If the ball hits the ground, the game ends in a loss. 1st level difficulty: The player controls a large tennis racket. 2nd level difficulty: The player controls a slightly smaller racket. 3rd level difficulty:' The player controls a small ping-pong racket. This page was last edited on February 19, 2018, at 17:40.